Meade Potato Company is proud to support the Incredible Edibles healthy eating and growing programme for primary schools in 2016. Incredible Edibles is a healthy eating initiative for Primary School pupils. It encourages schools across the country to get busy growing carrots, lettuce, potatoes, strawberries and turnips. Schools are supplied with grow packs containing everything they needed to grow a veritable feast of healthy foods! 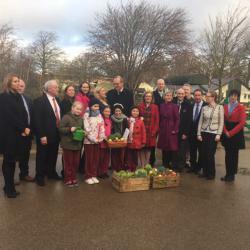 We are delighted to be sponsoring this programme which turns students into growers and schoolyards in to gardens - all the while teaching the importance of a healthy diet! 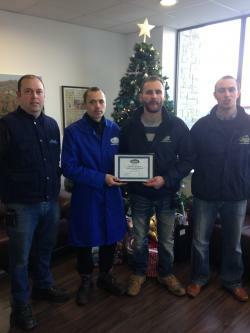 Our Employees of Quarter 4 were recently announced at our end of season Christmas festivities. 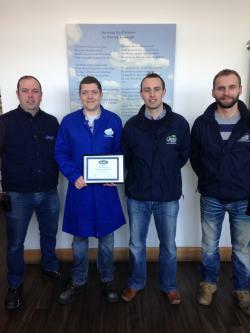 While we celebrated a great quarter's work from all our employees, we singled out the following: Romas Orlauskas (pictured left w/ Mark Fedigan & Mark McKenna) was awarded for his prodigious workrate in the Vegetable Division; Magdalena Krol (pic top right w/ Ronan McDonough & James Sheehy) won in the Fruit Division for her excellent eye in helping our Quality Assurance team, and Renatas Vaitekunas (pic bottom right w/ Tommy Clarke, Radek Krol & Philip Meade Jr.) was singled out in the Potato Division for his great diligence in grading and packing. A big thank you to Romas, Magdalena, Renatas and all our employees for a busy, efficient quarter! Meade are running a New Year - New Healthy You Nutribullet Competition to help you kick start a healthy new year. Win a Nutribullet to help you add lots of fruit, veg and fibre into your diet by making delicious, tasty smoothies. To enter, simply go to our Competitions page on this website under News & Events. 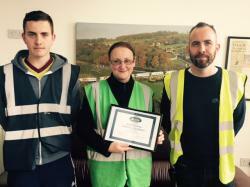 Three outstanding employees have been honoured in our Employee of the Quarter Awards for Quarter 3. 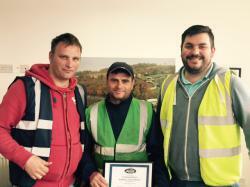 Owen Smyth, Jurgita Peleckiene and Constantin Rotaru received awards for showing great dedication during the busy harvest season of Quarter 3. Their efficiency and enthusiasm for the job has earned them the Employee of the Quarter Awards. 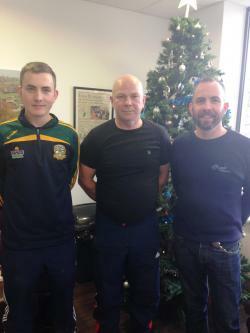 Meade Potato Company values all our brilliant employees but likes to recognise the extra effort put in by some in especuially busy times of the year. Owen Smyth of our Potato Division has been particularly efficient in dealing with the huge volumes of potatoes coming into the yard durig the busy harvest season. Jurgita Peleckiene is always punctual and hardworking for the Vegetable Division and is especially helpful in supporting our HR Department. Constantin Rotaru is a valuable contributor of our Fruit Division and is known for his ultra fast processing of all orders for loading. 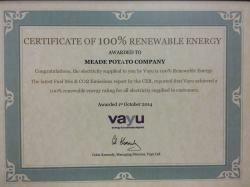 Meade Potato Company would like to thank all of these employees for their hard work throughout the year. Meade Potato Co. will head to Berlin from Feb. 2-4 to participate in Europe's largest fruit and veg trade fair, Fruit Logistica. 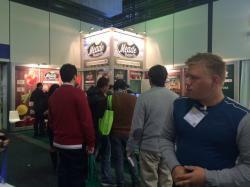 The annual trade fair gives us an opportunity to stay abreast of all the cutting edge developments in the fruit and vegetable trade, and to meet with potential customers, importers and exporters. We are in Hall 10.2, Stand A-10 if you would like to visit us! 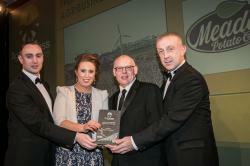 On a roll, Meade Potato Company win Fresh Fruit and Veg Agribusiness of the Year at national awards! 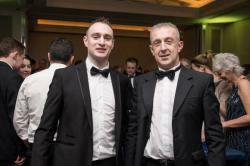 In what has been a bumper season for Meade Potato Company, we have claimed the Fresh Fruit and Vegetables Agribusiness of the Year Award at the Agribusiness Awards held on Dec. 8th at the Doubletree Hilton Dublin. Having an award that recognises the hard work that goes into bringing Irish consumers premium quality fruit and veg from field to fork is particularly gratifying to us as we primarily sell through our retailers own brands. This award recognises the companies that work behind the scenes, and we are delighted to give the credit to our amazing staff and our team of growers for all their efforts to bring the best to the plate of Irish consumers. We were also nominated for the Best Sustainability Award and the Health and Safety Award, two areas upon which we have been focusing for some time now. These nominations also meant that we were one of four companies to be nominated for the Agribusiness of the Year. Picture Left: Directors of the Meade Potato Company accept their Fresh Fruit and Vegetables Agribusiness of the Year Award from sponsors Sunday Business Post on Tuesday 8thDecember at the Hilton Hotel, Dublin. Left to right: Patrick Meade, Meade Potato Company; Eleanor Meade, Meade Potato Company; Noel Killeen, Sunday Business Post; Robert Devlin, Meade Potato Company. 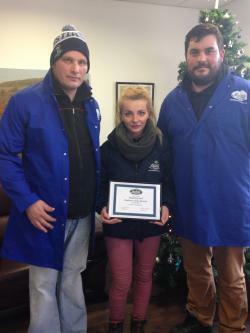 2015 has been a bumper season for awards at Meade Potato Company. 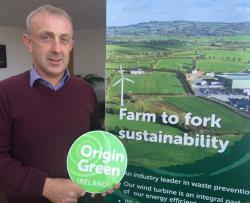 In addition to nominations for Best Fruit and Vegetable Supplier and Best Health & Safety at the Agribusiness Awards in December, our focus on sustainability has been acknowledged with three nominations in that category: the hotly-contested Bord Bia Food & Drink Sustainability Award, the Agribusiness Awards Sustainability Award and the Meath Business Awards Environmental Responsibility Award. We were delighted to win the latter award, and were taken by surprise when our name was announced again to win the Meath Business of the Year. In a county so rich with enterprising businesses, this is a real honour, and one that belongs to the team behind us here at MPC. A big thanks to all our employees and fellow growers for the part they have played in making this possible! 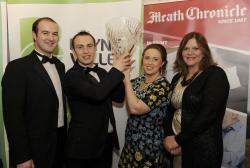 Pictured left to right Patrick Mongey, Philip Meade Jr., Eleanor Meade and Jeni Meade of Meade Potato Company at the Meath Business & Tourism Awards. On 28th and 29th Nov. Meade Potato Company will join 40 other artisan food, drink and craft producers at Kilsharvan House, Bellewstown to ring in the holiday season at the Festive Taste of Boyne Valley. 11-5pm. €5 per car to enter. Meade Potato Company are delighted to be named a finalist for another sustainability award this season, scooping the nomination for the Best Environmental Responsibility at the Meath Business Awards, Fri Nov. 27. Our commitment to farming sustainably and seeking better ways to manage our resources, our products and our co-products has resulted in numerous cost savings and resource savings that will benefit the environment. All our hard work to be as environmentally responsible as possible has been recognised as Meade Potato Company have recently become finalists for the Sustainability Award in the Bord Bia - Irish Food Board Food and Drink Awards. The Bord Bia Food and Drink Awards take place on Thursday 12th November, and we are honoured to have been chosen as finalists from a very competitive group of entries, along with AIBP, Dawn Meats, Glanbia, Island seafoods and Boortmalt. Meade Potato Company has always known the importance of managing our resources effectively in order to get the most out of our land. But in addition to this inbuilt agricultural appreciation of sustainability, Meade Potato Company has always been sustainable because it is usually the most efficient way to run the business. There is an aversion to seeing waste of any sort around the farm and production facility, and this prompted the company to adopt sustainability measures before sustainability was such a buzz word. In addition to employing sound agricultural practice, we have built an eco-friendly food production facility that includes a 300kW wind turbine to power operations, heat exchangers, inverters, skylights, energy efficient lighting, occupancy sensors, rainwater harvesting collection and plumbing systems throughout the facility. We recycle packaging materials, seek ways to reduce raw material packaging and have instituted a zero food waste policy. While we participate in numerous community social sustainability activities, we are passionate about food waste prevention. 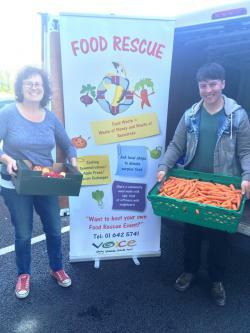 We have contributed to the Crosscare community foodbank since 2005, and have collaborated with foodcloud, VOICE, and Feed the 5000 Dublin on other waste prevention awareness projects. Managing our resources for the best possible result for the environment and the consumer is a challenge that we enjoy, and we encourage others to join us going green! 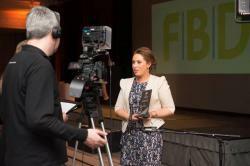 View our Bord Bia Sustainability Award video here.